For years, low carbon barbed wire has been the wire of choice for many landowners. Low carbon wire is made from steel rod with an approximate 0.06-0.08% carbon content while high tensile wire remains at approximately 0.28% carbon content. 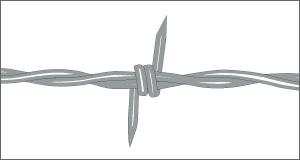 While low carbon barbed wire can be easily manipulated and has been considered the standard for years, it is prone to elongation, meaning it will sag or stretch over time. Low carbon barbed wire is designed with a continuous twist unlike the reverse twist design found in high tensile barbed wire products. Low carbon barbed wire is available in Commercial, Class 1 and Class 3 coatings. All Class 1, low carbon barbed wire products meet or exceed ASTM A-121 for product standards and come in 1320’ rolls. BW122TCP Texas Classic 2 12.5 Class 1 4" 27 88 LBS.